The owner of a rogue rhea which caused traffic chaos when it wandered on to a busy road during rush hour has said she was "mortified". 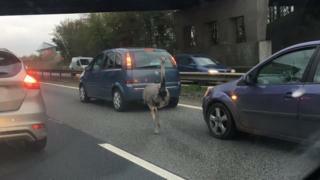 The flightless bird, called Colin, was spotted casually strolling along the A12 in Essex near Colchester United's stadium On Thursday. Debbie Johnson said Colin had escaped his field after a gate was left open. She said he escaped once before and was on the run for five days. This time he was quickly guided home by police. Mrs Johnson said: "Colin is a bit of an escape artist and we live quite near to the A12. "It appears somebody left the gate open while I was sleeping after a night shift." She said after discovering he was missing she went out to look for him only to find police officers "escorting" the bird home. "It is mortifying. I used to commute from Colchester to Romford and I hate that road with a vengeance so to see all that traffic is horrendous. "It is not the first time. He escaped not long after I got him and was gone for five days that time."